Welcome to part 6 of my Summer Side Dish Series. So far we have covered Chopped Salads and Coleslaws, Potato Salads, Pasta Salads, Side Dishes, and Fruit Salads. 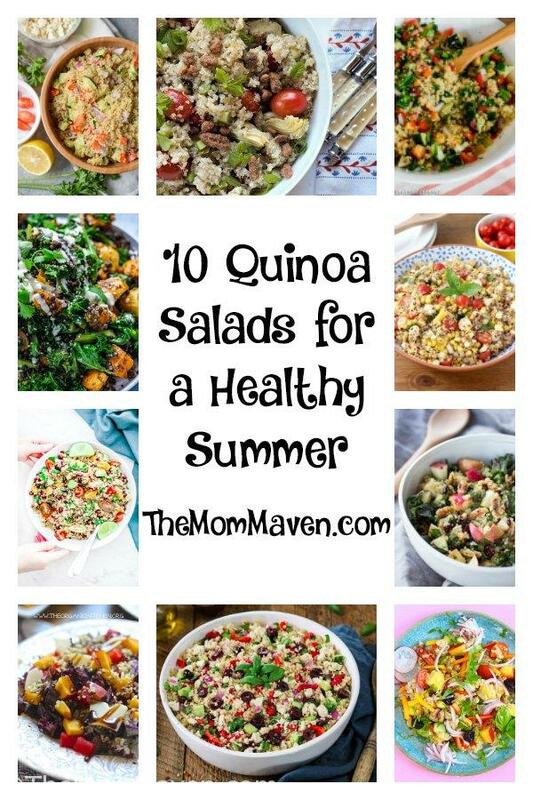 Today we have 10 Quinoa Salads for a Healthy Summer. I’m going to fess up here, I have only had quinoa once and I didn’t like it. I know I need to try it again, maybe one of these salad recipes will pique my interest enough to give it another chance. I know it is so good for me and I should be eating it. In case you don’t know what quinoa is, because I sure didn’t before it was served to me at a media event in 2011. (Yes, it’s been 7 years and I haven’t tried it again!) Anyway, quinoa is a flowering plant in the Amaranth family. It is a grain that is gluten-free, high in protein, contains all 9 essential amino acids, and is very high in fiber. We really should all be eating this superfood so here are 10 quinoa salads to help you add this to your healthy diet. Thankfully, some of my blogger friends do know how to add quinoa into their menus and they shared these recipes with me. Green Scheme TV shares this Lemon Garlic Mint Quinoa Salad recipe. This vegetarian Mediterranean Quinoa Salad from Vegetarian Mamma is perfect for those who love Mediterranean flavors. Heading to a cookout? Whip up this Make-Ahead Quinoa Party Salad from Project Meal Plan. Vegan Huggs gives us her rendition of a Vegan Mediterranean Quinoa Salad with Tofu. This Sweet Potato Quinoa Salad from The Cook Report could have gone in the potato salad roundup too, but I felt it fit better here. I love a good Caprese salad so maybe this Caprese Quinoa Salad with Sweet Corn from A Kitchen Addiction will be my next foray into quinoa eating. This colorful vegan Nectarine Quinoa Buckwheat Tabbouleh from Rhian’s Recipes looks beautiful. Dana at Killing Thyme says her Quinoa and Black Bean Salad is great for quinoa newbies like me. Unfortunately, we don’t like black beans either. I know, we are so picky! Planning a picnic? You will love this Picnic Perfect Kale Quinoa Salad and Cider Vinaigrette from Pass Me Some Tasty. The Organic Kitchen shared her Watermelon, Peach, Quinoa, and Purple Kale Salad.